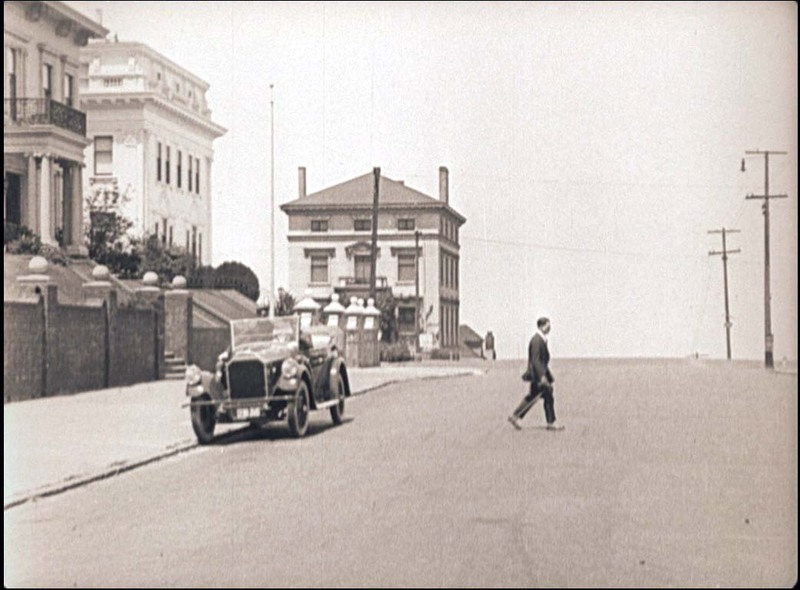 Buster Keaton in The Navigator looking north up Divisadero towards the corner of Broadway, in San Francisco. 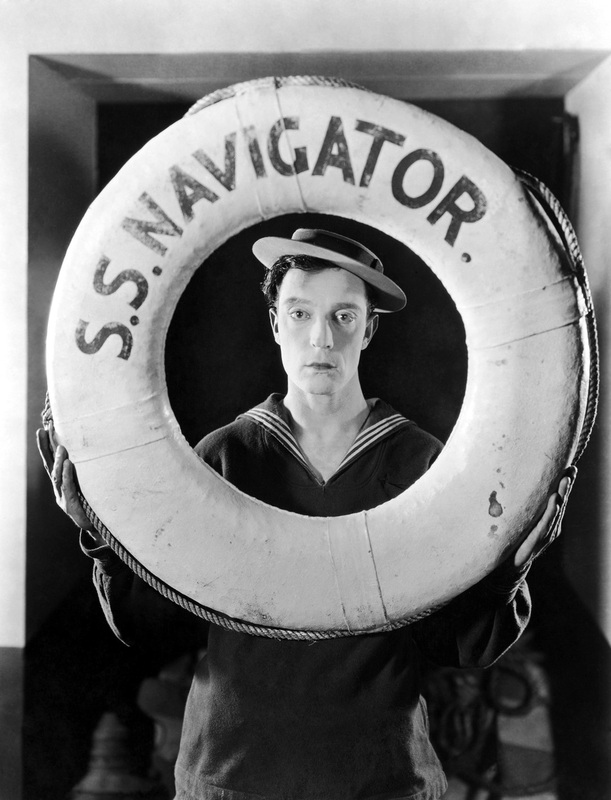 The 2014 San Francisco Silent Film Festival concludes Sunday, June 1, with a screening of Buster Keaton’s 1924 classic The Navigator, a personal favorite of Buster, and one of his most successful films. Early on The Navigator features a joke involving a U-turn. I won’t spoil the punchline, but it’s striking that the sequence was filmed hundreds of miles from Hollywood in the luxurious Pacific Heights neighborhood of San Francisco. As I explain with three examples in this post, Keaton the filmmaker went to great lengths to capture perfect scenes for this movie. Click to enlarge – portraying Buster’s mansion, the residence of Mr. A.D. Moore stood at 2500 Divisadero, once the only home on the east side of the street. The entrance-way to Buster’s mansion appearing in the movie has no flight of steps down, and thus was filmed elsewhere. 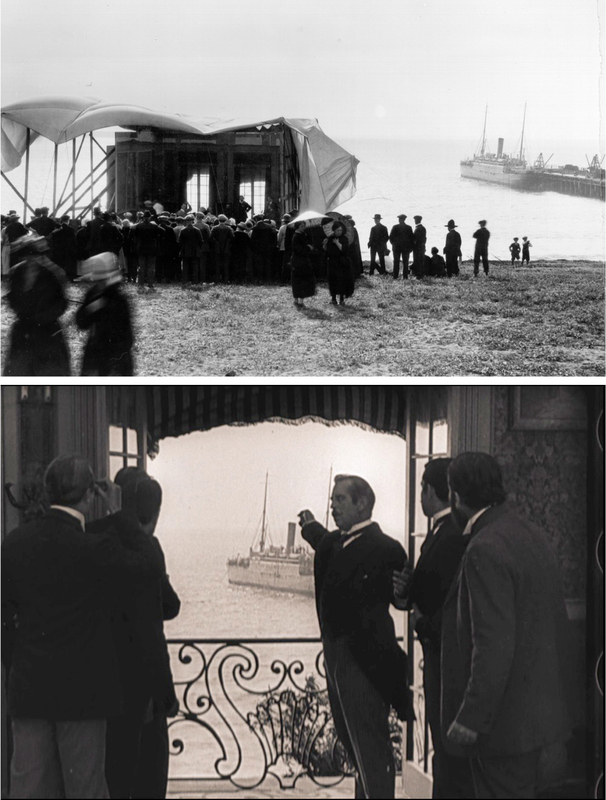 Although two Keaton biographies mention Buster filming scenes from The Navigator in San Francisco, neither cites a source for this detail, and neither provides a rationale for deciding to shoot so remotely. 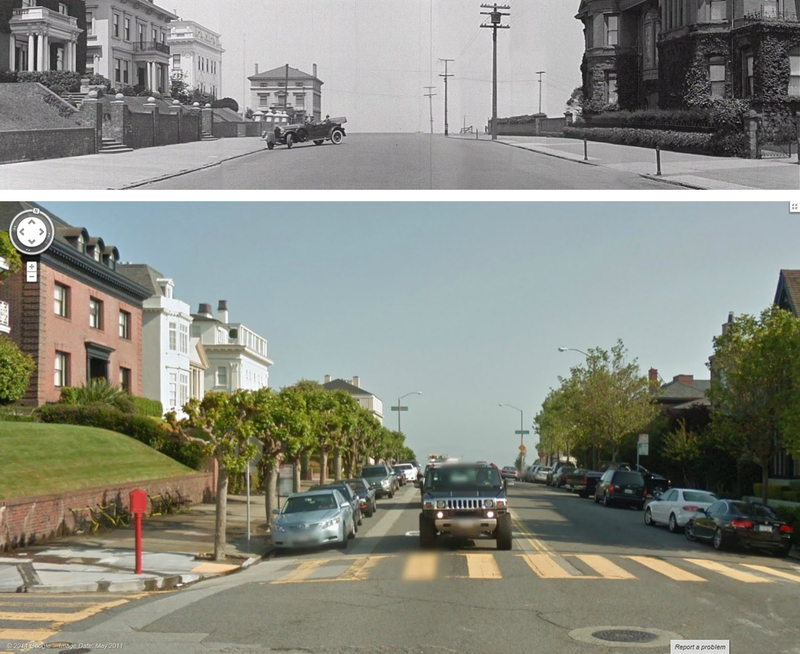 (Click to enlarge) Then and Now – at the far left, the red brick home that portrays Buster’s girlfriend’s home, 2505 Divisadero, has lost its front portico, while the neighboring white portico home has been torn down and replaced with two smaller homes. At back, the homes on the SW and NW corners of Broadway remain standing. The chimneys on the back NW corner home have been relocated from exterior to interior walls. At right, four homes now replace the Moore residence. Bonus! 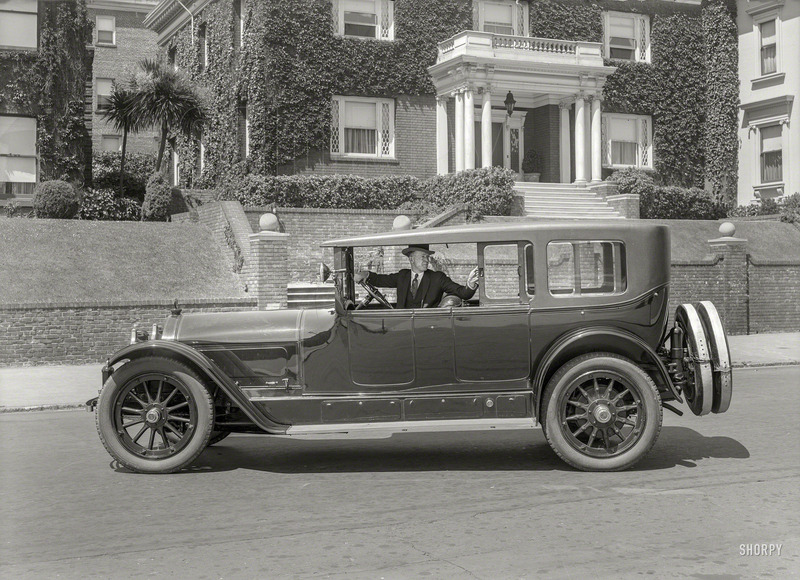 2505 Divisadero, that portrays Kathryn McGuire’s home, appears in this 1920 photo – posted by one of my favorite sites, Shorpy – the home of the high def historical photos. Keaton was both pragmatic and uncompromising as a filmmaker. He filmed dozens of prosaic insert shots for his movies, such as scenes of people walking along sidewalks, or crossing streets, directly across the street from his small studio. But as shown above, he would travel hundreds of miles to find the perfect setting for a gag. As I ponder in my book Silent Echoes, Keaton could have staged this U-turn scene from The Navigator at any number of posh Los Angeles neighborhoods. But as you watch the scene, instead of seeing rows of mansions on either side of the street receding into the distance, you’ll notice you don’t see anything at all. By filming from a low angle on the crest of a hill, Buster eliminated the background, focusing our attention on the foreground action. We may never know whether Keaton used this gag as a ploy to take a fun trip to San Francisco he could write off as an expense, or whether instead he thought the setting was so perfectly configured for portraying the joke that it justified an excursion north, but either way Buster carefully exploited San Francisco’s unique topography to full effect. A second example of Keaton’s determination when filming The Navigator occurs early on as well. As a visual storyteller, Keaton wanted to show in a single shot both the conspirators planning to destroy an ocean liner and the ship itself. 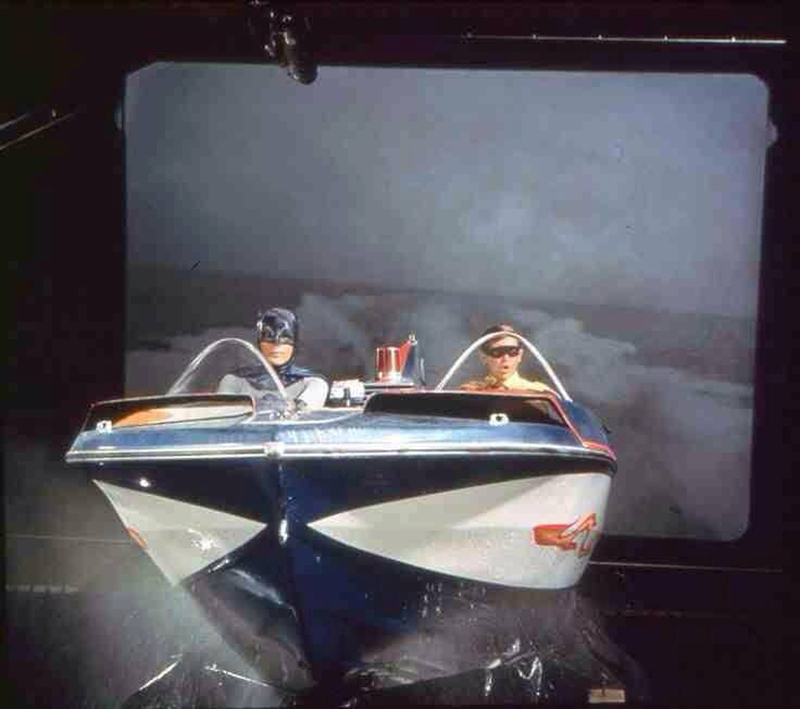 To do so, in an era preceding the rear-screen projection special effect (see convincing example at left! ), Keaton built a special set on a bluff overlooking the Redondo Beach pier (see below). Notice that the temporary set had no roof, but was instead covered with muslin to diffuse the natural sunlight for filming. The conspirators hatch their evil plan from within a tiny set overlooking Redondo Beach. The Navigator’s stunning underwater sequence provides a third example of Keaton’s uncompromising dedication to his craft. It was common practice at the time for movies to depict underwater scenes by placing a narrow aquarium, filled with bubbles and live fish, between the camera and the actors, hoisted on wires to appear buoyant while working on a dry set. Filming the dry actors through the “window” of the aquarium created a serviceable underwater image. 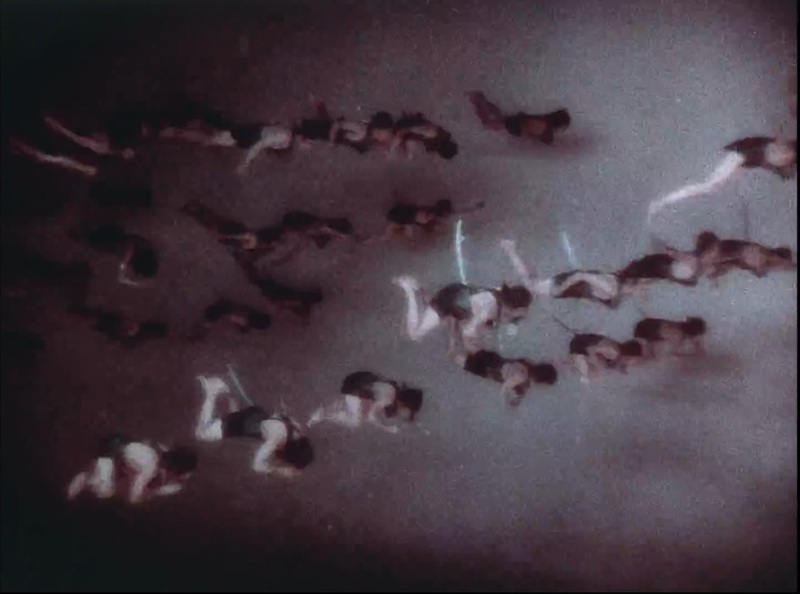 Douglas Fairbanks used this technique to great effect for a brief “swimming” shot of marauding thieves in The Black Pirate (1926). And yet for The Navigator Keaton donned a deep-sea diving suit, and spent a month filming in the clear but frigid waters of Lake Tahoe. He didn’t have to do this. Buster could have used The Black Pirate effect (above), or easily hired a stunt man to take his place in the identity-concealing suit. 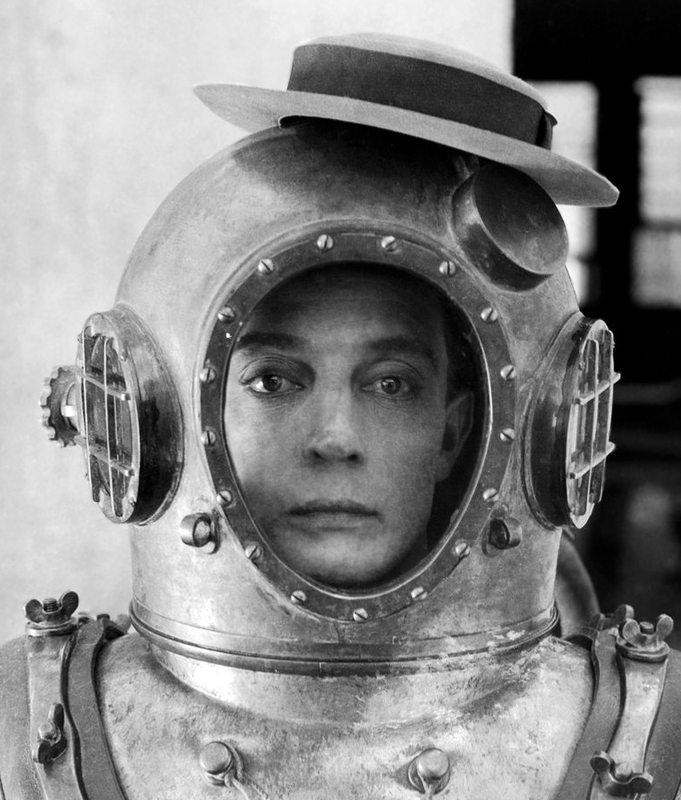 Instead Buster built a diving helmet with a special glass panel large enough to reveal his entire face, so the audience would always know it was really him beneath the waves. Buster knew the audience could tell the difference between a true and staged effect, and thus did his utmost to film things without fakery throughout his career. The resulting scene completely captures your attention, and ranks among the best (and perhaps only) true underwater sequence from the entire silent film era. Was there ever a more heroic filmmaker than Buster Keaton? Buster clambered around trains, paddle-wheelers, and sailing ships; navigated white-water rapids and the open ocean; outran hordes of police and herds of cattle; rode horses; worked with lions and bears; braved cyclones, dodged collapsing buildings, and plunged off of waterfalls. And for a month he donned a 200 pound claustrophobic suit to film at the bottom of Lake Tahoe. Buster put his heart and soul into every movie he made, and as a result, ninety years later they still continue to amaze and entertain. 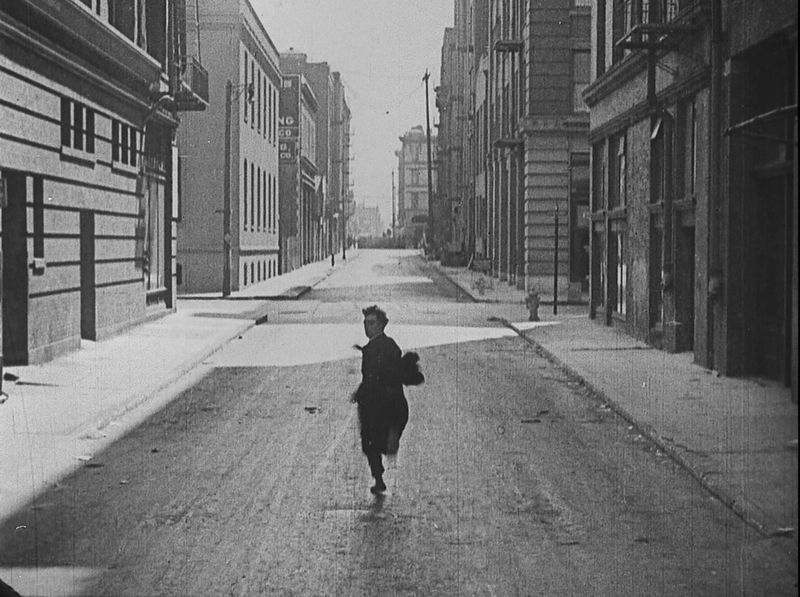 PS – as I explain in my book, Keaton previously staged a chase scene from his short film Day Dreams (1922) in San Francisco, while ingeniously cutting back and forth with scenes filmed in Hollywood. You can read about these North Beach/Financial District locations at this link below. Here’s The Navigator U-turn setting as it appears today. This entry was posted in Buster Keaton, San Francisco and tagged Broadway, Divisadero, Hollywood, Keaton Locations, Pacific Heights, San Francisco, San Francisco Silent Film Festival, San Francisco then and now, Silent Comedians, Silent Movie Locations, Silent Movies, The Navigator, then and now. Bookmark the permalink. Keaton was the king. You can never get bored watching his films. Loved the sentiments in this post. And what amazing behind-the-scenes photos–thank you much, sir! That Pierce-Arrow touring car was a good choice, as it is a beautiful machine! Wonder if it was his personal car?